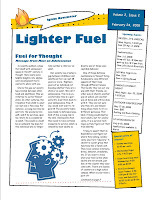 If your a parent of a high school student at New Life Church, or are a parent interested in the high school ministry of New Life Church, or are simply interested in the high school ministry of New Life Church, please check out the March edition of the Ignite newsletter by clicking here. In it you will find an article about the upcoming Utah Mission '08, meeting times, other upcoming events, birthday announcements and prayer requests. Are you, dear reader, the parent of a teenager who attends high school in the USA? Or are you a teacher at an American high school? If you know any parents / teachers you can send this link to, please feel free. I’m interested in all opinions!